So we’re assuming most of our readers have seen The Hunger Games movie at this point. What did you think? Were you happy with how the filmmakers adapted the story? Were you surprised by any changes that were made? I thought the movie was very entertaining overall and about what I expected. I loved Amanda Stenberg as Rue and Stanley Tucci as Caesar Flickerman in particular, as well as the little pings of the silver parachutes floating down. 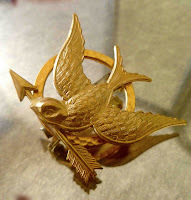 I wore my mockingjay pin to the theater, of course! Are there other 2012 bookish films that you’re dying to see? The Hobbit, The Perks of Being a Wallflower, or maybe Breaking Dawn Part Two? We couldn’t stop laughing when we saw the trailer and Robert Pattinson says to Kristen Stewart, “We’re the same temperature now.” Hee hee! The bookish film I’m dying to see above all others this year is Snow White and the Huntsman. It’s a fantastic trailer and it’s gotten me super excited about seeing the movie in June. I will also be in line to see Les Miserables in December. World War Z looks entertaining too, although apparently it’s nothing like the book. I’m disappointed that the release date for Warm Bodies has moved to February 2013, though. I really liked this wistful love story that happens to be about zombies, and I’m hopeful that the film keeps the quirky, somewhat philosophical vibe of the book. Still, there are some fun adaptations coming up this year. Let us know which ones you’re dying to see! Congratulations to to Heidi and Lucy for winning our spectacular Blogoversary giveaway! It looks like both of them are going to be very busy with reading material for quite some time. And happy blog birthday to us! It was so great to read your wonderful comments about what you enjoy most about our blog. As always, thanks so much for visiting with us here. Cheers to the next year! I’m coming at this a bit late but just wanted to say Happy Blogoversary!!!! And I too adored Stanley Tucci. He is one of my very favorite actors. I can’t say there was a single actor I didn’t love. I am so excited about all the book to movie adaptions this year. I’m not sure I can pick just one. THG was great, Caesar and Rue were my favs too. Such a great trailer, isn’t it? I had my doubts before I actually saw it (K Stew and CT aren’t necessarily my faves), but it’s one of those cases where it seems like everything everything came together beautifully. Plus…Chris Hemsworth. :D Need I say more? I still need to watch and laugh at New Moon! I can’t wait for The Hobbit since the Lord of the Rings film trilogy is one of my favourites. I’m excited for Snow White and the Huntsman (hope Kristen’s acting will be better) but even more for Mirror Mirror since it seems like it’ll be very quirky. Oh man, New Moon was the best Twilight film to MTS3K yet, hah. I think Kristen will probably have better dialogue in SWATH, so hopefully she’ll be a little more dynamic in that one. The trailer gets me ridiculously excited every time I see it. I haven’t seen it yet, sigh, hopefully soon. I can’t wait for The Hobbit either! Get thee to the multiplex, Heidi! ;) Hope you get to see it soon. Aww, Hobbitsy tears! I hope it lives up to your expectations, KM. Although I’m sure they’ll do a great job and it will be epic. Snow White seriously looks amazing! I still have to watch the Hunger Games, but I’m glad to have heard that a lot of people were happy with it. I also can’t wait for the Hobbit, I loved the Lord of the Rings films and after everything Peter Jackson had to go through in making that film I’m sure it’s going to be awesome! I was surprised by the Snow White trailer, it actually looks pretty awesome, if you ignore the fact that Kristen Stewart is in it. Oops, I meant to link to an article about the film. Thanks for pointing that out. That’s the first time I’ve sent he full trailer for SW and the Huntsman. That looks so good. I’m looking forward to The Host. I have a long wait but I enjoyed the book and I hope they don’t mess up the movie. Isn’t that SWATH trailer awesome? I haven’t read THE HOST yet, but several people have mentioned they’re looking forward to the film, so I should look into it! I don’t blame you for waiting for the crowds to die down a bit for THG, it can get pretty crazy in the first few days. :) Hope you enjoy when you get around to it, Karen! Yes, I thought the things they added made sense for the most part. There were some things I really missed, mostly involving Rue, but overall the film was great. Ahhh I really want to see Snow White & the Huntsmen too! If it’s anything as insanely cool as the trailer, I know I would love it. I think it’s so interesting to contrast it with Mirror, Mirror and its totally different tones. Hah, yeah…I’m not that excited about Mirror, Mirror. In comparison to Snow White and the Huntsman, well…there is no comparison! I guess we’ll have to wait for reviews to come in before we can really tell, though. I haven’t seen the movie yet, but I hope soon! just need some more time lol. Hope you get a chance to see it soon, Melliane! It’s a pretty good adaptation, if not entirely perfect. I LOVED Stabley Tucci as Ceasar! Despite myself, can’t wait for p2. OMFG! Can’t WAIT for The Hobbit! And Snow White and the Huntsman! Yessssss! World War Z! I completely forgot! Eeeee! So many amazing movies!! I was very pleased with The Hunger Games and it surpassed my expectations. Looking forward to seeing it again so I can relax and enjoy it. Snow White and the Huntsman does look excellent too. The trailer that got the most applause at my theater was Titanic – go figure. Congratulations on winning the big ebook bundle, Lucy! And oo, I haven’t seen the trailer for the Titanic rerelease yet, that was probably pretty fun to see on the big screen again. I enjoyed The Hunger Games but I’m really looking forward to Snow White, I saw the trailer last year and can’t believe it’s still not out until June! Seems like there are a few movies I’m excited to see, but can’t remember what they are now. OH, Abraham Lincoln Vampire Hunter… the new Resident Evil movie… hmm.. I know there’s more. Oh yeah, the Lincoln trailer looked pretty fun, too! I forgot about that one, which is silly since the trailer played right before THG. My most anticipated movie was Hunger Games and now that I’ve watched it, I can’t wait for Snow White and the Huntsman!! For next year, I’m looking forward to The Host. Do you hear the people sing, singing a song of angry men, it is the music of a people who will not be slaves again! Okay, I’ll stop. But it’s very hard. :D I can’t wait for Les Miz–this is really a great year for book to movie adaptations. :) Hope they do the books justice. Aw, I’m sorry you lost your pin, Carrie! Hope you can find a replacement now that there’s HG merchandise out. I loved Tucci in THG; he was definitely my favorite part! As for bookish movies, The Hobbit is what I most want to see-it comes out on my birthday! Yay! Happy Blogoversary (again), and that you lovely ladies SO much for the giveaway. I couldn’t be happier to be honest. I have NOT seen the HG movie yet as I have this hatred of movie theaters, and opening weekends in general, but I’m still planning to make an exception and go see it tomorrow or Monday. I CANNOT WAIT for Snow White and the Huntsman. I may not be a Kristen Stewart fan, but omg that movie is looking amazing. Maybe it’ll change my tune. Maybe she’ll prove to me she can be something other than moody and a lip biter. Of course I’m also excited for The Hobbit, and the main reason I want to see The Perks of Being a Wallflower is to see Emma Watson. Aw, it’s our pleasure, Heidi! I confess to being especially pleased when a reader who chats with us often ends up being the winner, hah. :) Your comment about KStew being a “moody lipbiter” made me laugh. Can’t wait for you to receive your books! We’ll get those out to you shortly. YAY! Happy Blogoversary! I saw The Hunger Games at midnight and YES! I loved it! It was everything I expected and more! Congrats to the winners and happy blogoversary! Yeah, I think most people will be happy with THG movie, Small Review. :) I don’t blame you for waiting, it gets a little intense on opening weekends sometimes. Fortunately our theater does reserved seating, so that helped a little. Thanks so much for the blogoversary wishes! I loved The Hunger Games movie. There were somethings I would’ve liked to see, but overall, I think they did a really good job. And the movie I’m most excited about is The Perks of Being a Wallflower. What a great cast! I am really looking forward to seeing Snow White and the Huntsman too. It looks like it’s going to be fantastic!! The Breaking Dawn pt 2 trailer made me laugh a little too, but of course I will be seeing that. The Host has me Pretty excited. I really liked the book and I am curious to see if they do the movie well.